REDFISH LAKE -- Flames lashed out at Idaho's beloved Redfish Lake on Tuesday, threatening a fish hatchery, forcing evacuations of the nearby Buckhorn subdivision, campsites and the historic Redfish Lake Lodge, and prompting an elite Type 1 command staff to be summoned to take over today. Tuesday, the deafening pitch of the helicopter screamed across the Sawtooth Valley as the pilot hovered over the rising plumes of smoke. Below were homes, cabins and campsites planted directly in front of the fire line. The pilot lowered a few feet more and released thousands of gallons of water onto the blackened mountainside. The 210 Road Fire ignited Monday afternoon on state land by the Sawtooth Fish Hatchery near Idaho 75, said Julie Thomas, spokeswoman for the U.S. Forest Service. The blaze has scorched nearly 300 acres. Firefighters aren't estimating when they can contain the fire, as it burns dry and dead lodgepole pine along with plenty of brush. Ash-covered trees revealed clues as to where the fire threatened to consume cabins and houses. By Monday evening, the blaze had burned to the edge of the Sawtooth Fish Hatchery. While fenceposts lay broken and charred, flames did not destroy any structures. The hatchery's visitors center will remain closed until further notice. Not far from the hatchery, firefighters manned helicopters to protect a row of houses and yurts from the growing flames. While most of the fire had consumed the beetle-killed trees the night before, firefighters still were dropping buckets of water Tuesday to defend against the small but advancing flames. Nearby campsites -- evacuated from the night before -- remained vacant, and empty tents flapped from the gusts of wind the helicopter produced. 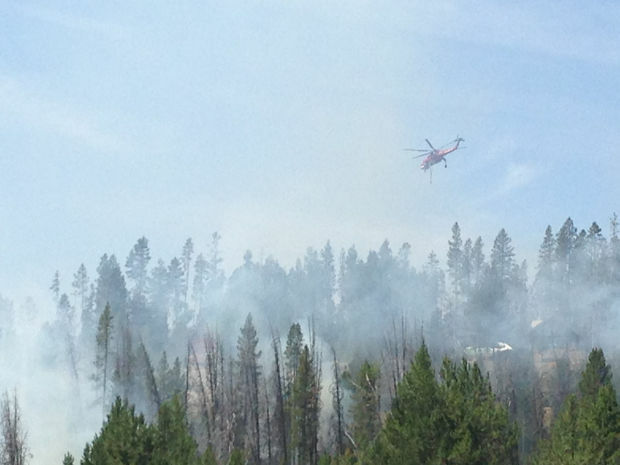 Along with houses, fire officials also evacuated campgrounds on the south side of Redfish Lake. Guests staying at the historic Redfish Lake Lodge, circa 1929, fled the scene, and the evacuation order remained in effect Tuesday. "We're letting campers go back in and get their stuff they left behind on Monday," said Stacey Clark, spokeswoman with the U.S. Forest Service. "But the lodge is closed." Nearly 250 fire personnel are helping contain and manage the fire, Clark said. Along with helicopters and an air tanker, four hotshot crews, four Type 2 hand crews and 18 engines were responding to the 210 Road Fire. Tuesday, smoke was no longer billowing into a single column but dispersed throughout Stanley and trailed 60 miles south into Ketchum. The Stanley Ranger District saw a steady flow of hikers, campers and firefighters looking for information about the 210 Road Fire. Kristine Kraushaar spent almost an hour working with rangers, trying to find out where her family could and could not hike safely. They had come Monday afternoon to camp. But by the time they reached Redfish Lake, the smoke had kidnapped the sky, and the lake was closed off. Nabbing a spot at Stanley Lake, Kraushaar wasn't going to let the fire ruin her family's vacation. "We like Redfish because it's good for kids," she said. "We're hearing that it might open before we leave on Sunday." Flames jumped Idaho 75 on Monday night, forcing the highway's closure. Law enforcement reopened the road Tuesday, but Thomas said motorists should call the highway department before traveling in the area, as more road closures are possible. The 210 Fire is the latest wildfire burning across southern and eastern Idaho, a section of the state that has experienced steady temperatures in the high 90s, lightning strikes and a lack of rain. As of Tuesday, more than 1,000 firefighters, managers and support staff were assigned to 11 fires across the region. Near the town of Challis, crews were working on the Lodgepole Fire, which started Saturday and so far has scorched nearly 1,280 acres. The blaze prompted the evacuation of three ranch homes and the closure of a forest service campground. The largest fire in the state is the 7,040-acre Brown Butte Fire near Shoshone. Officials said the blaze was smoldering and almost completely contained. Crews also have gained the upper hand on the human-caused Pine Creek Fire, which started last week in the forested mountains northeast of Boise and has burned 2,797 acres. Officials said the blaze was 90 percent contained, and mop-up crews were to focus on rehabbing fire lines and monitoring areas where the fire still was smoldering. The Ridge Fire, burning 14 miles north of the town of Lowman, grew Monday and has now charred 3,704 acres, some of it in a forest area scorched during the summer of 2006. The fire was 10 percent contained. Four more crews have been called in to help build fire lines north of the Ridge Fire. Firefighters in northern Idaho also responded to a 10-acre fire that broke out Monday in Q'Emlin Park in Post Falls. The cause of the fire remains under investigation, but fire crews from Alberta, Canada, joined local forces to fight the blaze burning in a municipal park and its 40-acre trail system.